The SCCS published the its Opinions on the safety of the fragrance ingredient Acetylated Vetiver Oil, and the hair dye 1,2,4-Trihydroxybenzene. They have been adopted during the plenary meeting of 21-22 June 2018, and are opened to comments until 10 September 2018. According to the applicant Vetiver oil is produced for the fragrance industry by distillation of fresh or dried roots of Vetiveria (Chrysopogon) zizanioides originating from different geographical areas. The Vetiver oil is then subject to further processing to obtain Acetylated vetiver oil (CAS No84082-84-8, EINECS No282-031-1). 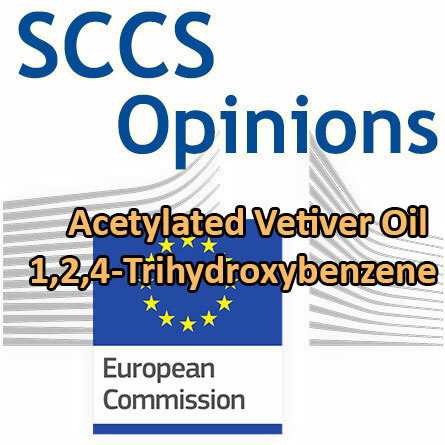 In December 2014, the Scientific Committee on Consumer Safety (SCCS) adopted an Opinion on Vetiveryl acetate (SCCS/1541/14). During the commenting period IFRA sent an update dossier in which it was raised the necessity to modify the initial request on this substance, such as the identification/name of the substance and its use concentration in different cosmetic product types. The SCCS considered the request appropriate in order to finalize the Opinion focusing on the substance Acetylated Vetiver oil. IFRA recommends a safe concentration limit for Acetylated vetiver oil when it is used in the specific categories of cosmetic products as reported in the Table 1.